Gameloft has announced the release of Siberian Strike for the iPhone and iPod touch. It’s available from the App Store for $6. 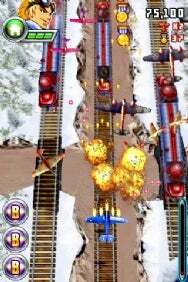 A vertically scrolling shoot-em-up, or “shmup” in gamer’s parlance, Siberian Strike harkens back to classic arcade games like 1942. In fact, the game is set in the 1940’s, as you take controls of one of three different fighter planes as you track and destroy an evil cyborg from the Soviet Union, intent on invading the free world by using a dangerous drug called Stalinka. The gameplay combines shooting and specific assignments; while it looks 2-D, it actually features 3-D graphics and some 3-D gameplay modes. Four difficulty levels keep up the action, and you can choose between accelerometer and touch-based controls. There are boss fights and Wi-Fi-based multiplayer support, and 12 levels to win, with power-ups that imbue your fighter with special abilities like shields, electric bolts and more. System requirements call for iPhone 2.2.1 software or later.